I don’t read a great deal of fiction, to my shame, other than the classics. At my age the only problem is with remembering names. When I call everyone darling, it has damn all to do with passionately adoring them, but I know I’m safe calling them that. Although, of course, I adore them too. I think it is obscene that we should believe that we are entitled to end somebody’s life, no matter what that person has supposedly done or not done. In other words, if you – the cost of promoting movies, the advertising and promotion of a movie, the budget is almost as large as the cost of the movie. I’m a passionate trade unionist. I think Tom Paine is one of the greatest men that’s ever lived. I do not have a brain that I long for in dealing with matters of which I am ignorant, that don’t come within my ken and a rationale, a reason, and argument and so on, and I can’t do that and I’m not in that bracket at all. 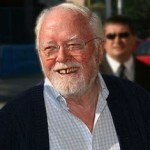 Richard Samuel Attenborough, Baron Attenborough is an English actor, director, producer and entrepreneur. He is the current President of the Royal Academy of Dramatic Art. As a film director and producer, he won two Academy Awards for Gandhi in 1982. He has also won four BAFTA Awards and three Golden Globe Awards. As an actor he is perhaps best known for his roles in Brighton Rock, The Great Escape, 10 Rillington Place, Miracle on 34th Street and Jurassic Park.